Each structure bears a Tropical Contemporary design, six to seven stories high and highlighted by modern lines and weather-resistant materials that blend seamlessly with the cove's natural bounties. Spacious interiors and a wide array of unit sizes are being offered to match various leisure living preferences. Most units also come with extensive balcony areas and large bay windows, giving residents priceless panoramas of the surrounding mountains, sea, and lagoon. A promenade ringing the area is perfect for interacting with neighbors and leisurely walks toward the beach. The convenience of a quick weekend getaway truly becomes a reality at Pico de Loro's residential condominiums. Take a weekend or out-of-town trip anytime you wish, and just lock up your unit and leave. Round-the-clock security, reliable utilities, property maintenance, and other modern amenities give the discerning weekender the peace of mind they truly deserve. Plus, practical yet durable finishes allow easy upkeep of your vacation home. 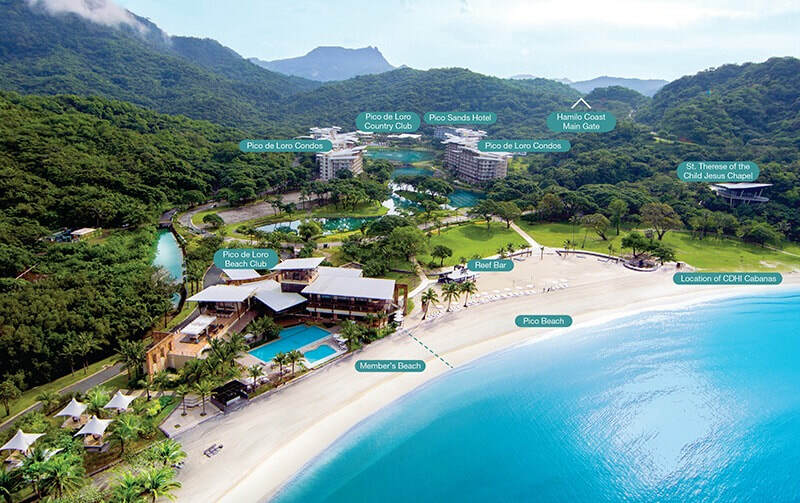 ​Paradise begins to unfold at Pico de Loro Cove, the first of Hamilo Coast's developments. This unique leisure community brings together families and friends who desire dynamic activities amidst a spectacular setting of lush forests, verdant mountains, and fine white sand beach. Be a resident at one of Pico de Loro Cove's residential offerings and experience what a true leisure vacation destination feels like within the privacy of your own space. Wake up each morning invigorated with the sea and mountain breeze touching your skin. Take pleasure in leisurely strolls around the lagoon plaza and walk towards a fine sand beach with views of the horizon. 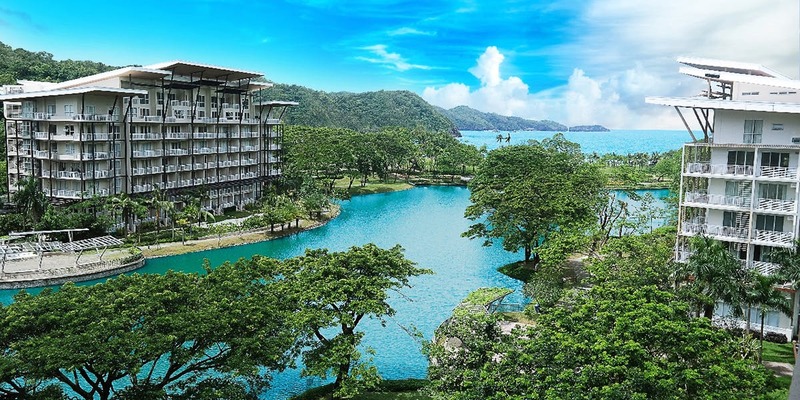 Become a member of the exclusive Pico de Loro Beach & Country Club and proactively seek synergism with nature. Be it on land or on sea, the club gives you and your guests countless opportunities to do so. Go on eco-trails, kayak, scuba dive, birdwatch, or tour Hamilo Coast's magnificent coves. If a day is not enough to fully enjoy the grandeur of nature, a nearby hotel will gives you the chance to extend on overnight or week-long visits. Hamilo Coast contains arguably some of the most enjoyable beaches in the Batangas area renowned for resorts and beaches. Among them, Pico de Loro's beachfront is roughly a kilometer stretch of fine sand, starting from the Pico de Loro Beach Club and extending way past Pico Point, Hamilo Coast's visitor center. The natural beauty of the beach is further enhanced with the combination of a grassy lawn area, enabling more activities to do at the beach and creating a one-of-a-kind seaside experience. From the Beach Club, a coconut-lined serpentine pathwalk leads to a necklace of open spaces throughout a sprawling lawn. An ampitheater-like spectator mound adjacent to the Beach Club is a venue for twilight concerts, wedding receptions or other social events. Next stop is the Lagoon Plaza, a view deck that looks toward the lagoon, condominium clusters, the Country Club, and the Azurea Hotel. Moving eastward, a lounging lawn tucked under coconuts and pink plumerias is a good place to read a book, sunbathe, or watch an unfolding game of ultimate frisbee. On the sands of the beachfront, one can engage in beach football and volleyball. At the end of the day, unwind at the beachfront gazebo to admire sunset views or have cool drinks under the night sky.